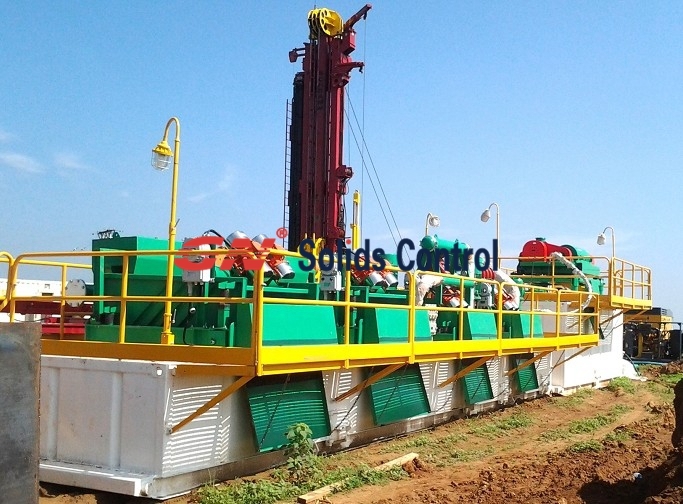 On the basis of group together the advantage of solid control cycle system, domestic and international alike, the solid control cycle system is a the system product which is designed by grouping the practical demand together of the well drilling craft. It practice by five level treating sections: shale shaker, vacuum degasser, desander, desilter and centrifuge. It can process, then storage and mix of drilling fluid in the tank below the solids control machines, remove the harmful solid cutting, maintain the level of purified of the drilling fluid. Drilling fluid that require in the special situation during the cycle such as fluid weight added, shear and issue removal, and can increase the efficiency and safety of well drilling function effectively. It is convenient to transport by the road and railway, and it can be moved to the well site at a minimum distance. The corresponsive match of the solid control equipment is essential, the one to five level of the process should be correspond each other, and the interval of separation size should be appropriate and have a certain overlap, and the smaller particles which are not disposed by the upper can be disposed in the next level. The mud which is withdrew out from the wellhead then it well be transported to shale shaker or enter into the mud tank below after disposing by shale shaker. The mud which overflowed from the mud tank (if the gas exist, it can start the vacuum degasser, and inhale mud from the degassing warehouse, and enter into the desanding after degassing). The mud will enter into desilter after be disposed by desander. The mud disposed by desilter enter into drilling fluid centrifugal through the mud tank, the mud disposed by centrifugal enter into the vault and through the mud tank, and the well drilling pumps pump the drilling mud into well hole repeatedly for using circularly. It contents the normal cycle and stable status of the mud in the drilling process. Under the premise of safety, environmental protection, efficiency to ensure the task of well drilling.